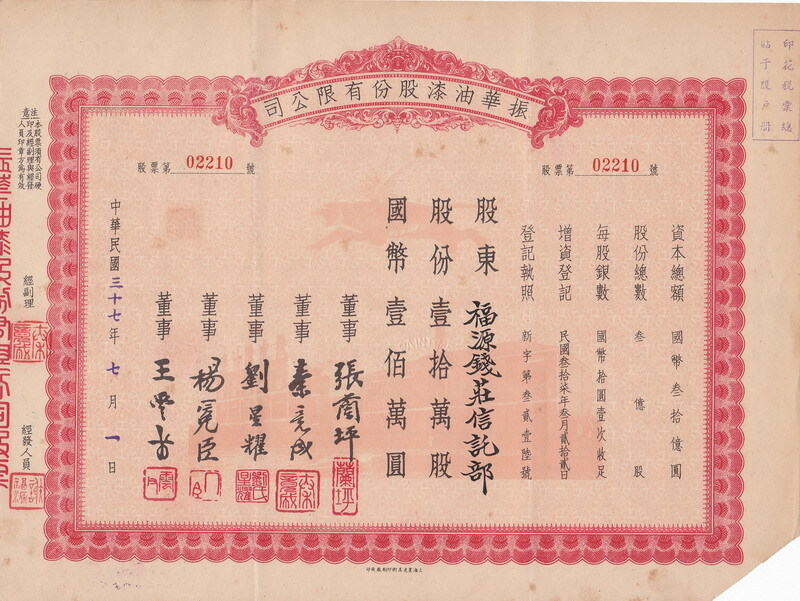 Shanghai Mount Tai Realty Co., Ltd, Stock Certificate of 100 Shares, 1944. Please refer the picture, VF condition. 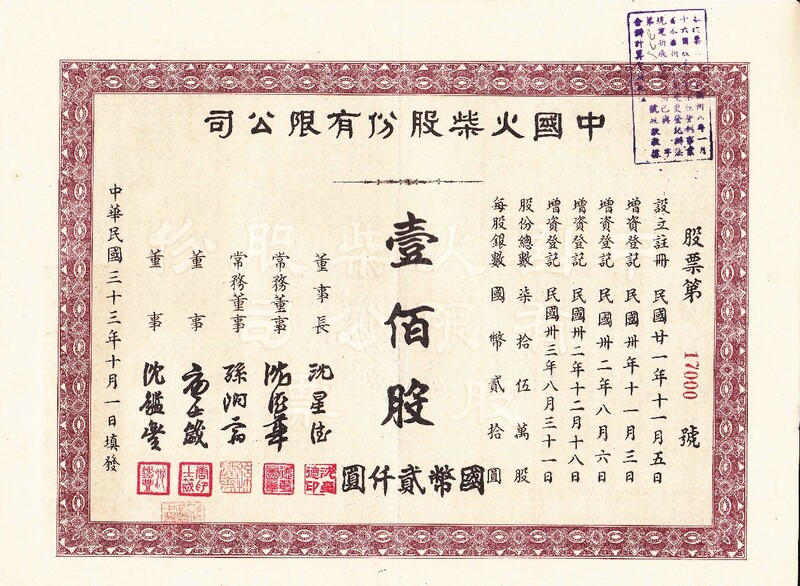 This company is established in 1944, was the largest company in Shanghai in 1940's. 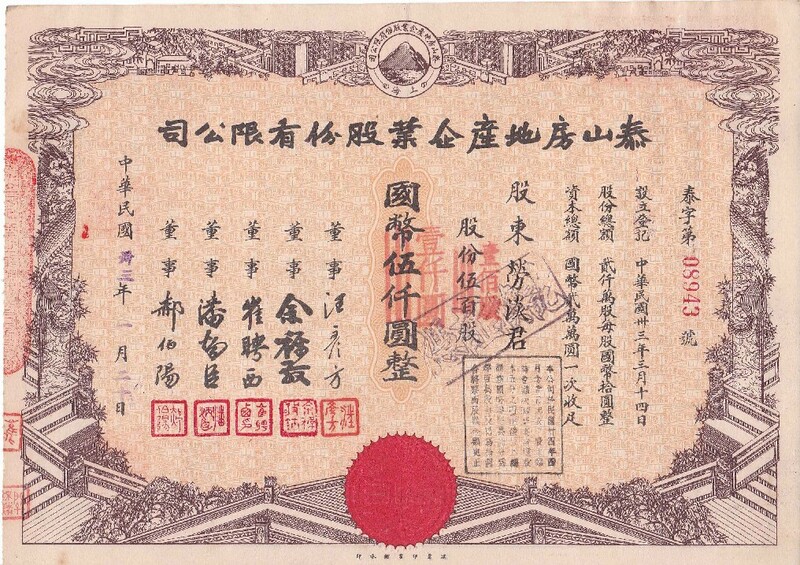 Issued in 1944 in Shanghai. Size: 210mm*155mm. 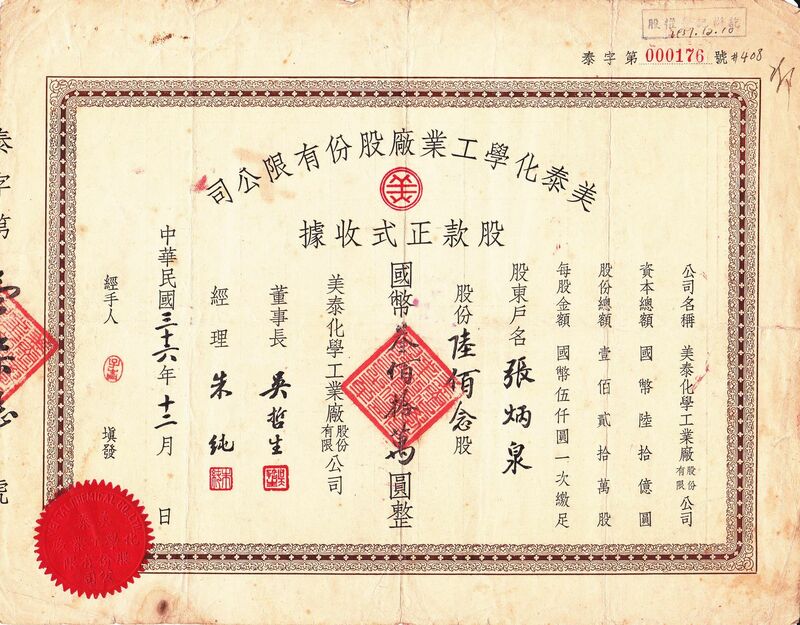 S1005, Shanghai Jin-Fu Textile Mechanical Co. Hand-write Shares, 1948. This is hand-write shares, that is 719,380 shares totally. 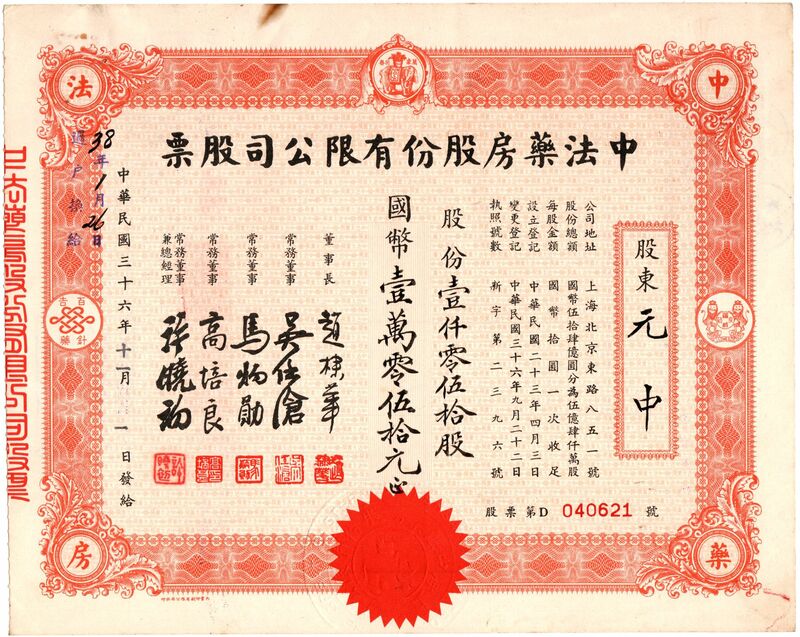 S1006, Shanghai Jin-Fu Textile Mechanical Co. Stock Certificate of 1947. 50 Thousand Shares. VF condition. 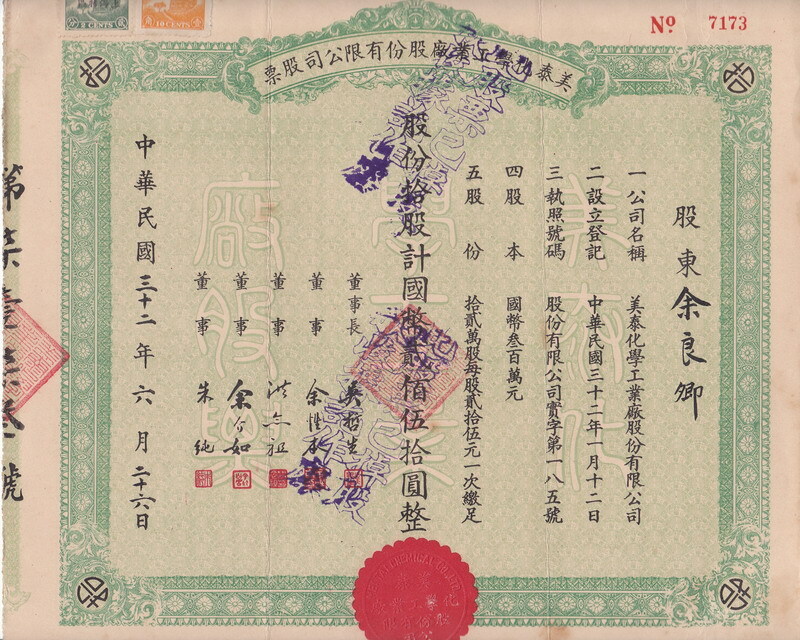 S1007, Shanghai Jin-Fu Textile Mechanical Co. Stock Certificate of 1948. 100 Shares. VF condition. Size: 335mm*183mm. Long size. 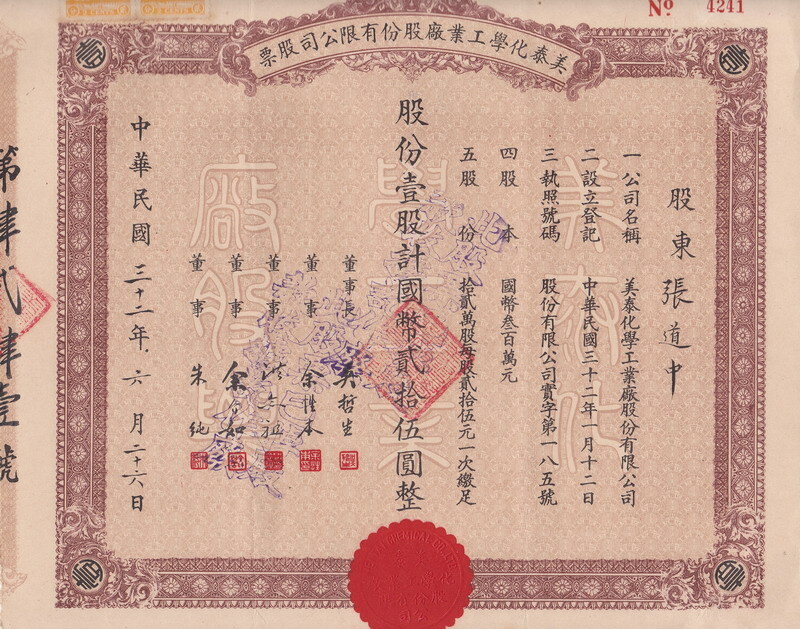 S1009, Da-Yu Chemical Co, Shanghai, Stoc Certificate of 10 Shares, 1943. Stock of 10 Shares. The face value is 100 Dollars. 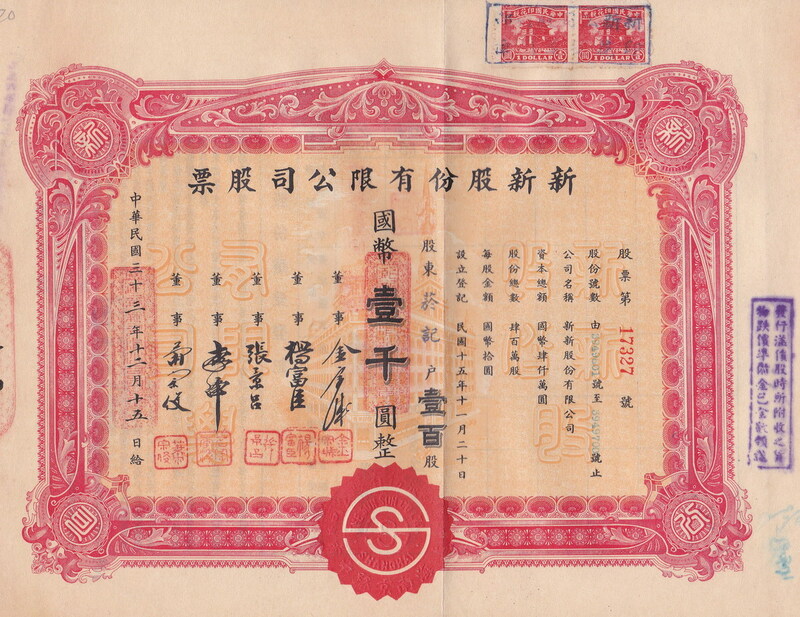 Issued in 1943 in Shanghai of China, during Japanese occupation period. 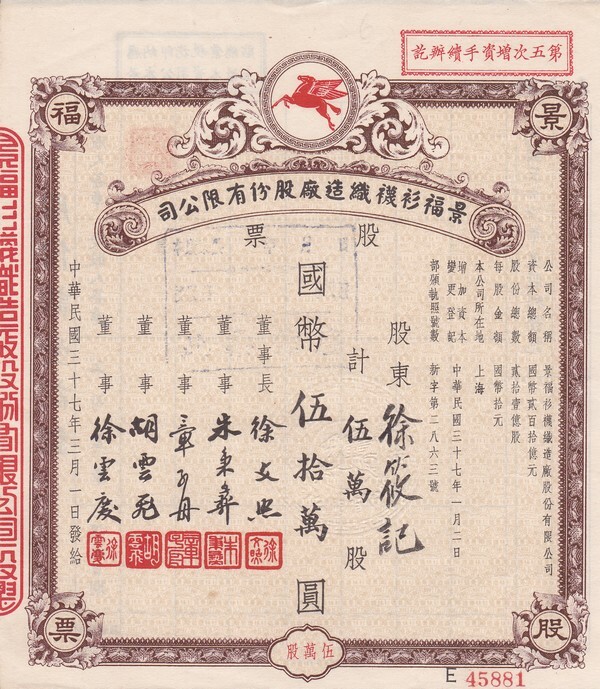 S1011, Stock Certificate of Xin-Ya Real Estate Company, Shanghai 1944. Please refer the picture, VF condition. 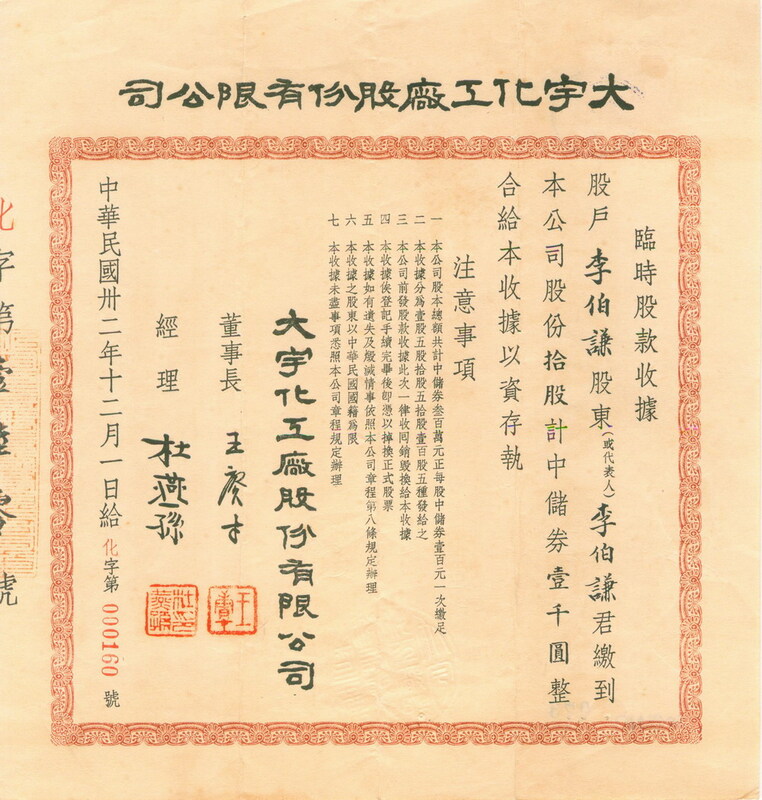 Issued in 1944 in Shanghai. 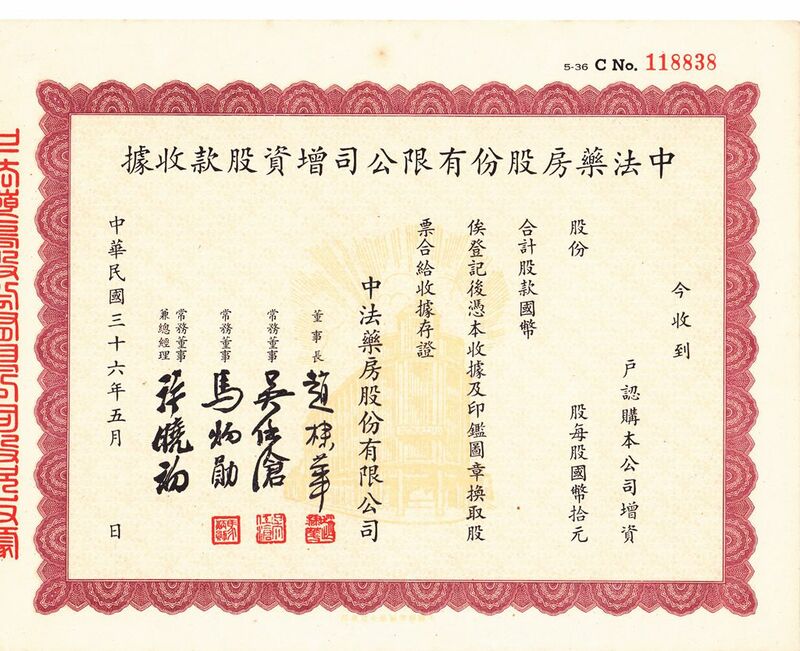 This certificate has stock of 3000 shares, with the face value of 30,000 Yuan. Size: 290mm*210mm. 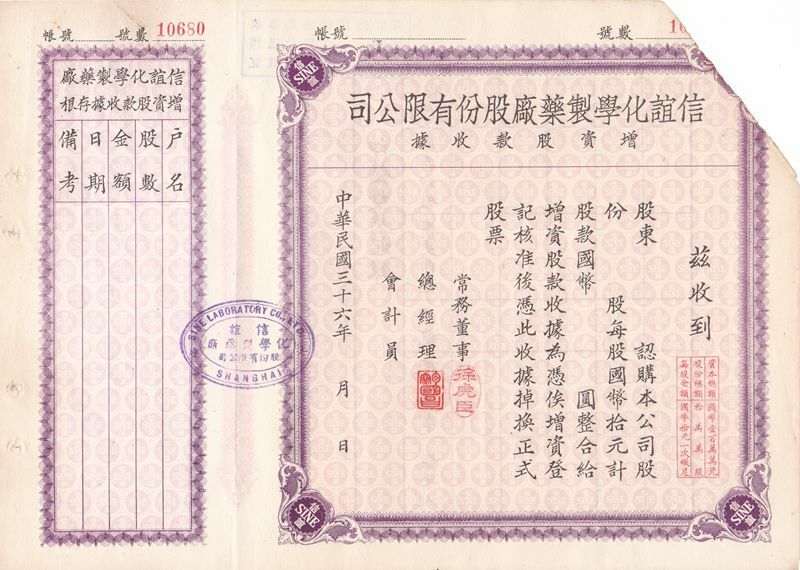 S1013, Shanghai Sine Chemical Medicine Co, Stock Certificate 1947. Please refer the picture, VF condition. One edge was cut, which means cancelled in 1950's. 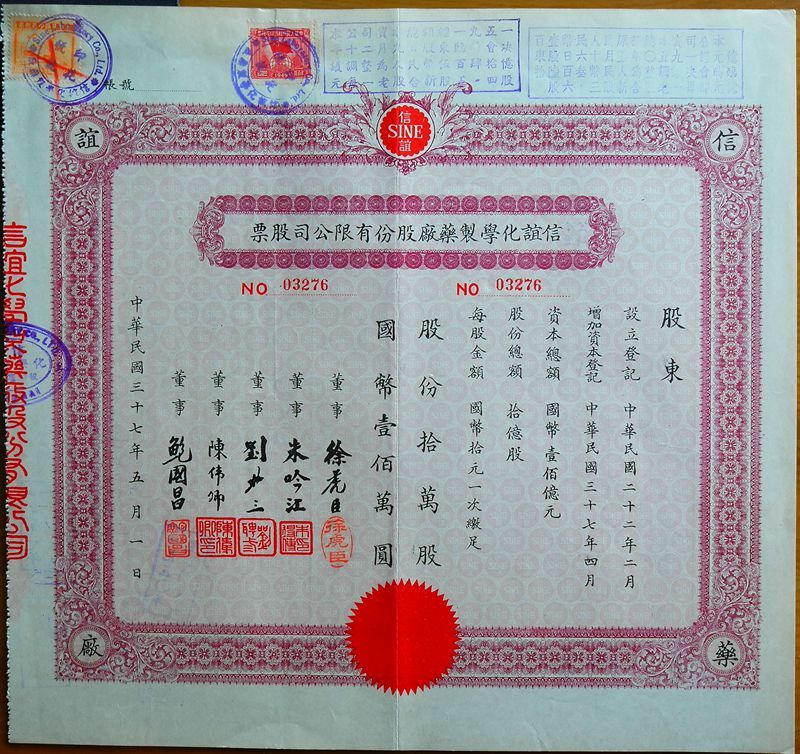 Issued in 1947 in Shanghai. 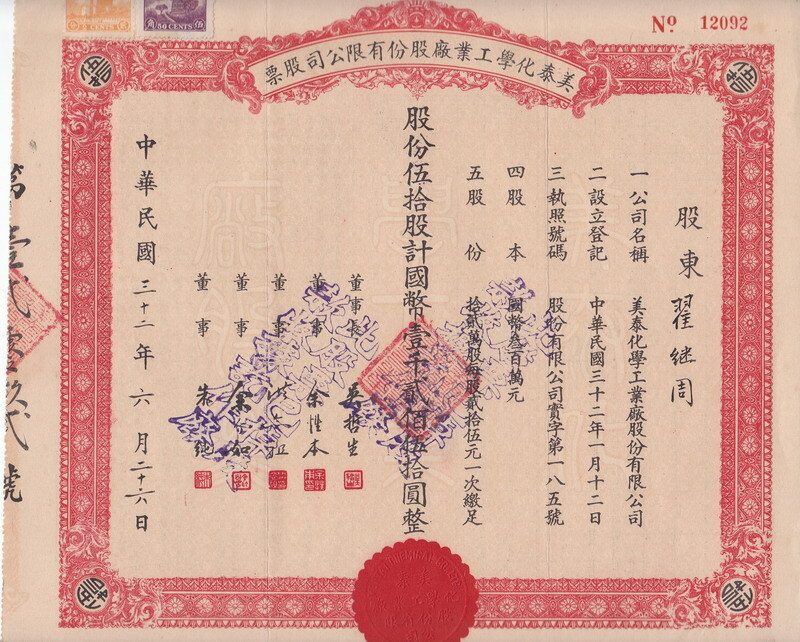 S1015, Stock Certificate of He-Yi Industrial Co, Shanghai 1947. Please refer the picture, VF condition. 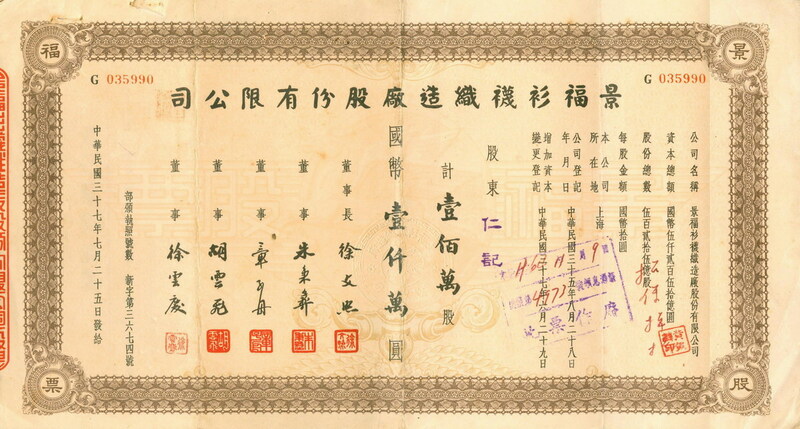 Issued in 1944 in Shanghai. 250 Shares, with the face value of 2500 Yuan. Size: 260mm*190mm. 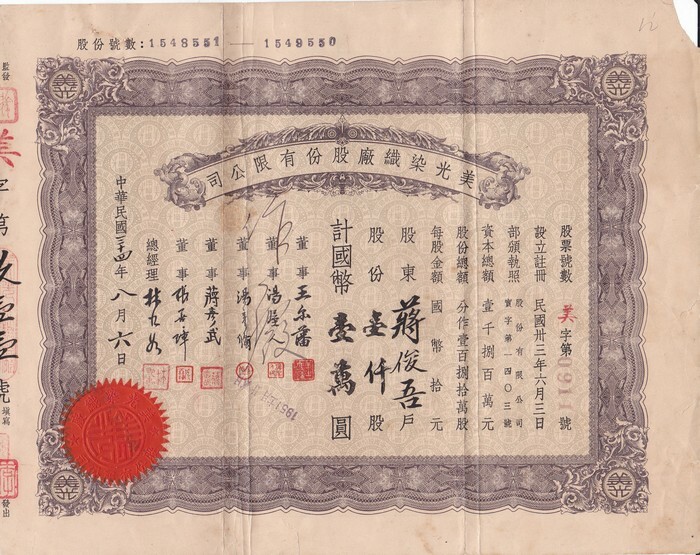 Mei-Tai Chemical Company, Stock Certificate 1 Share, Shanghai 1943. Please refer the picture, VF condition. Unused, uncirculated. Issued in 1930's in Shanghai. 1 Shares with the face value of 25 Dollars. Size: 270mm*260mm. 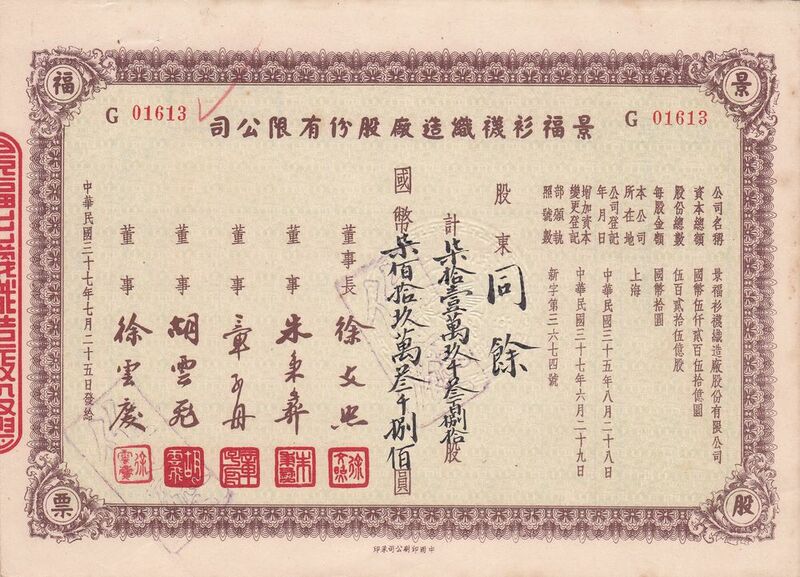 Mei-Tai Chemical Company, Stock Certificate 10 Share, Shanghai 1943. Please refer the picture, VF condition. Unused, uncirculated. Issued in 1930's in Shanghai. 10 Shares with the face value of 250 Dollars. Size: 270mm*260mm. 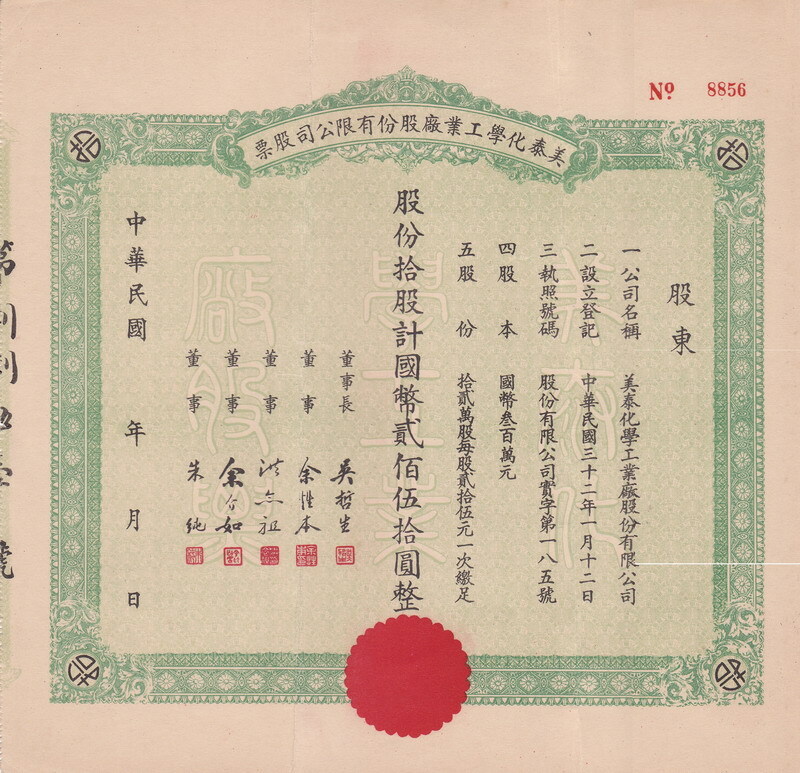 Mei-Tai Chemical Company, Stock Certificate 50 Share, Shanghai 1943. Please refer the picture, VF condition. Unused, uncirculated. Issued in 1930's in Shanghai. 10 Shares with the face value of 1250 Dollars. Size: 270mm*260mm. 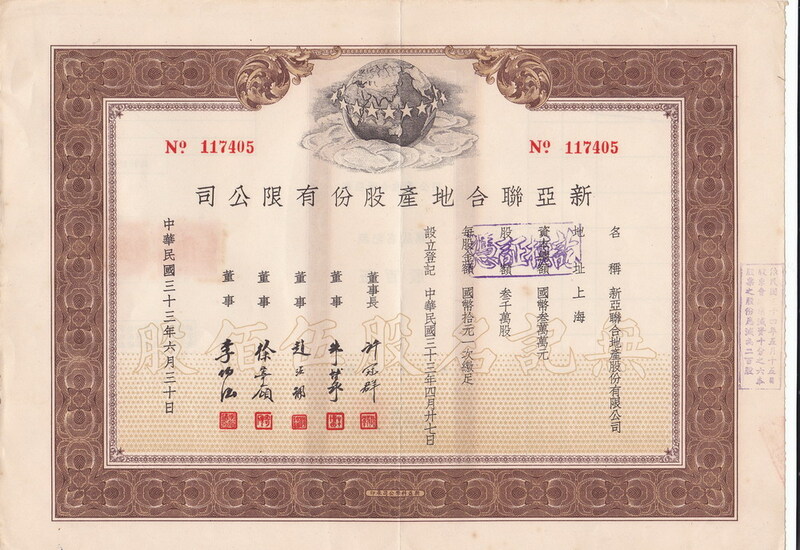 Mei-Tai Chemical Company, Stock Certificate Unused, Shanghai 1943. Please refer the picture, VF condition. Unused, uncirculated. Issued in 1930's in Shanghai. Size: 270mm*260mm. 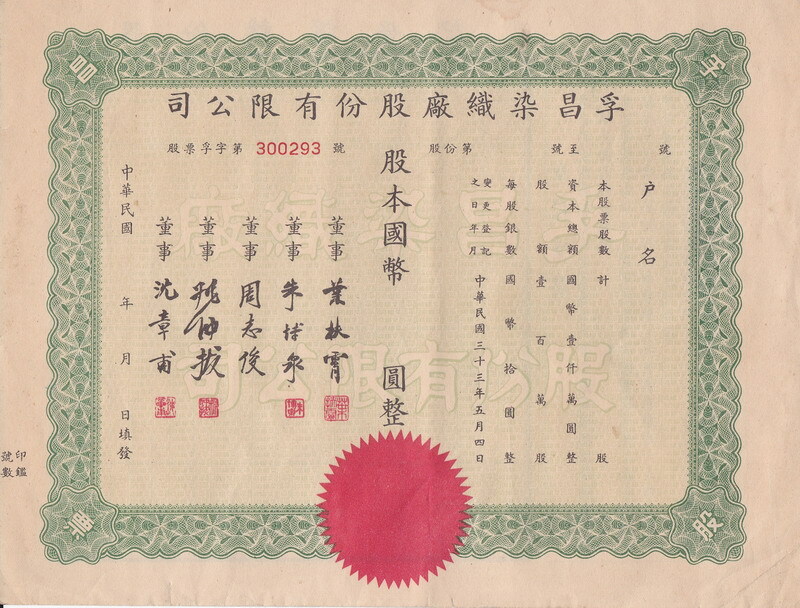 S1024, Mei-Tai Chemical Company, Stock Certificate 62 Shares, Shanghai 1947. Stock of 62 Shares. The face value is 620 China Silver Dollars. Size: 270mm*212mm. 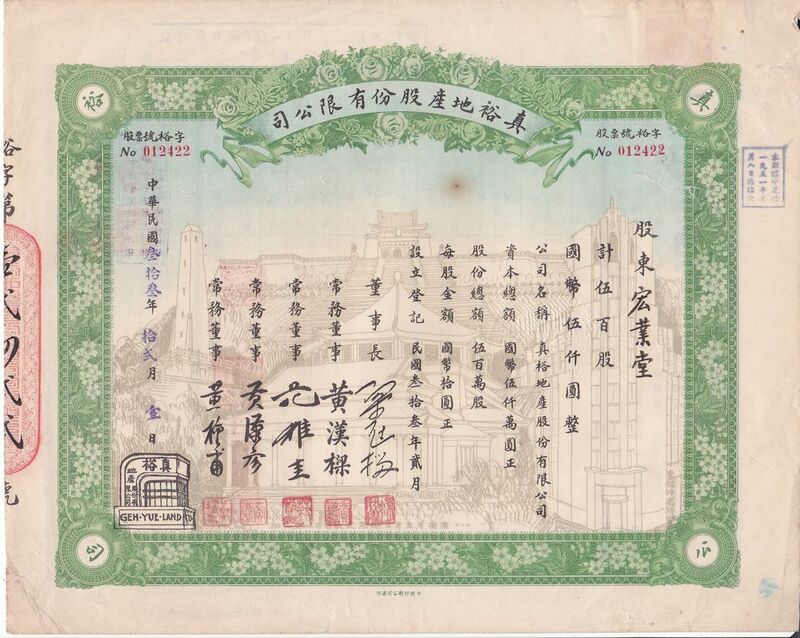 S1027, Sino-French Pharmacy Co, Unused Stock Certificate of May, 1947. Unused. Size: 220mm*175mm. 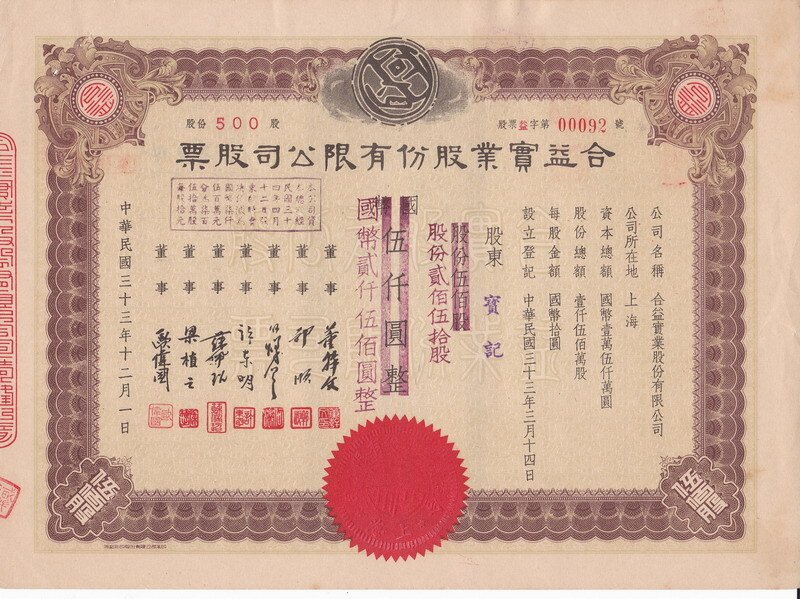 S1028, Sino-French Pharmacy Co, Stock Certificate of 50,000 Shares, 1947. Stock of 50,000 Shares. Size: 220mm*175mm.